I don’t usually read anything that sits in the Horror genre, because for some reason I can’t quite put my finger on, it’s never truly appealed to me. I suppose this should be rather surprising, given that the majority of titles that I read and review these days can be sat comfortably into two fairly niche genres – the Cthulhu/Lovecraftian Mythos and post-apocalyptic/zombie fields – and both contain a fair bit of overlap with Horror. But despite dalliances with James Herbert and Stephen King during my childhood, I always preferred science-fiction or some good old-fashioned zombie horror. However in recent weeks I have found myself drawn to the genre thanks to some of the titles I’ve been reviewing; reading the fantastic Chthonic anthology from Martian Migraine Press let me encounter Ramsey Campbell’s peerless The End of a Summer Day, which is an amazing piece of psychological horror that really works its way into your head and doesn’t let go; and then last week author Mike Thorn contacted me to see if I was interested in reviewing Darkest Hours, an anthology that collects together a number of his previously-published horror short stories and released by Unnerving Magazine. Mr Thorn offered to send me a copy of the anthology in return for a fair and honest review, and while I hadn’t ever reviewed a horror title before, I was between books and decided to take a quick peek at the book’s Amazon listing. One look sealed the deal for me and lead to me accepting that review copy – and why? Because, as I feel like I’ve said a thousand times before in reviews, the cover art for the title was good enough that it instantly caught my eye and made me want to read it. Unfortunately the illustrator of the piece isn’t credited as far as I can see, but whoever it was has done a brilliant job; looking like the battered and worn cover of a used Betamax cassette from the 1980s, the title and author’s name scrawled on in black felt-tip on a sticker from, the cover art is not only high-quality but also thematically appropriate, tying into one of the short stories in the anthology and generally giving off a vaguely sinister air. I should also mention that the copy-editing is top-notch as well – when it comes to indie releases you can never be sure how many errors and typographical mistakes you’re going to find, but I failed to spot any errors in Darkest Hours, which is always a bonus. The cover art and editing are of good quality, but that doesn’t mean much if the stories themselves aren’t any good. Well fortunately they are good; very good, in fact. I can’t remember the last time that a collection of short stories, or even an entire novel, has invoked so many different emotions in such a short period of time – reading through the anthology, I rapidly moved from disgust (with an accompanying feeling of nausea), to being chilled, to outright laughter, and then back to a general feeling of being unsettled. Being able to make a reader run a gamut of different feelings in only a few hundred pages is definitely the sign of a great author. The anthology consists of 16 short stories, and I enjoyed all of them while I was reading the collection, but a few stood out as particularly fine examples of Mr Thorn’s craft. The opening story, Hair, is the piece of writing that inspired the disgust and nausea I mentioned above, and even now, as I’m writing this, I physically feel like gagging; to avoid both spoilers, and the spoiling of my lunch, I’ll merely state that this tale of a man who becomes obsessed with hair – both his own and that belonging to others – is an incredibly strong piece of writing that manages to deftly portray a man’s rapid descent into obsession and disturbing behaviour without falling into the trap of being over-descriptive. Mictian Diabolus is a fast-paced and creep as hell story about a group of teens who break into a school looking to take drugs and see the place where their serial killer principal eviscerated many of their classmates; and A New Kind of Drug is an intriguing tale of a schoolboy who finds out that the drug his new friend is taking is quite literally alien, and has some interesting things to say about bullying and the dangers of familial abuse. Mired is one of the funniest horror stories that I’ve ever read – in fact, it may be one of the funniest stories I’ve ever read, regardless of genre; it’s a skilful and painfully self-aware takedown of the self-obsessed nature of philosophers and their texts that had me openly grinning by the end of the story. Moving through the collection, The Auteur is a genuinely shocking piece of horror that reminded me of films like Rec and Sinister, where a naïve video store worker is introduced to the concept of genuine horror by a mysterious co-worker, and it has an ending that is just begging for a sequel, ideally as a fully-fledged novel. Economy These Days is another piece that stood out for me, primarily because of how uncomfortable it made me: unlike most of the stories in the anthology, there’s no outright horror here – no serial killers, no aliens, no hair-eating store owners – just a grim and thought-provoking look at how far someone might push their limits in order to try and make enough money to survive in modern society. And finally, the closing story of the anthology, Fusion, has a very Lovecraftian feeling to it, as a group of camping buddies suddenly find themselves confronted by a creature that wants to bring them all together – quite literally, in fact. This is a fantastic collection of horror short stories, to be frank. The ability of the author to move through so many different kinds of horror scenarios, and to invoke so many different emotional responses in such a short space of time, is surely the mark of someone who ‘gets’ horror as a genre. 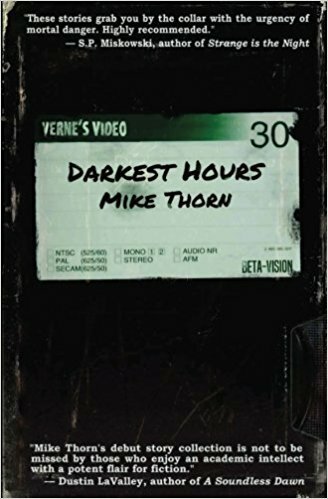 Mr Thorn has certainly made his mark on the genre as a whole, and also on me: I look forward to reading more horror stories, and especially any more that come from his pen. I can only hope that we see more of his fiction in the near-future, and whole-heartedly recommend that you pick up this anthology.